Cigarette cards, packaged with tobacco and intended to incentivize purchases among collectors, were familiar bits of everyday ephemera between the late nineteenth century and the middle of the twentieth. 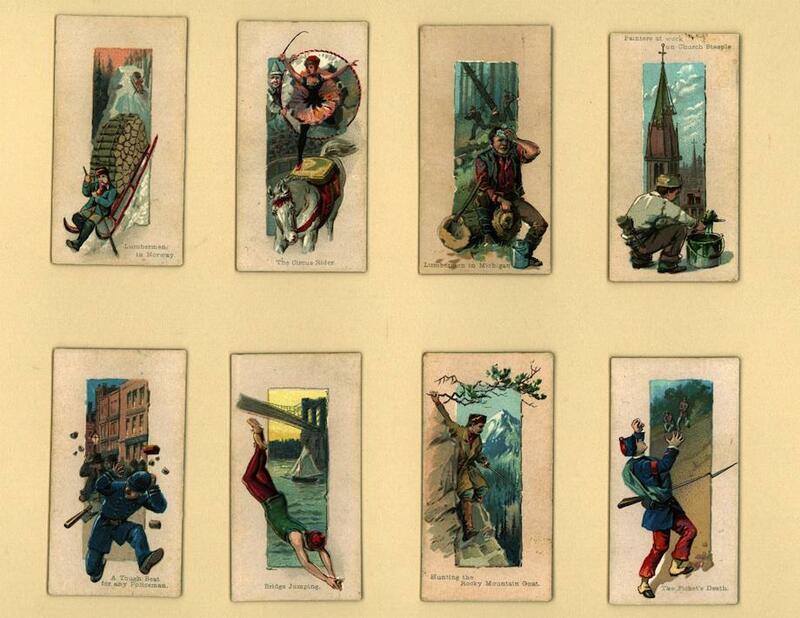 This set of cards, “50 Scenes of Perilous Occupations,” came with cigarettes manufactured by W. Duke Sons & Co, and was probably printed around 1890. 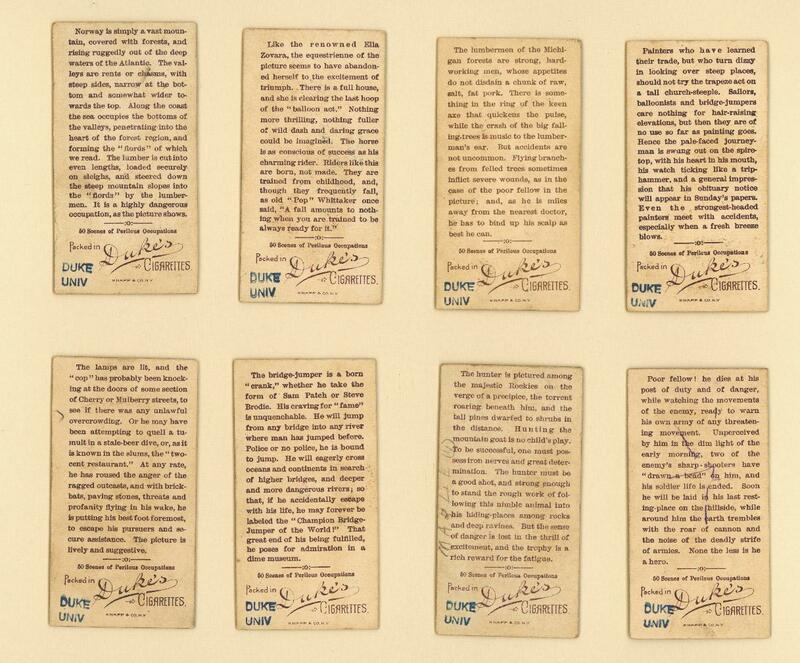 In their miniature representations of intrepid men doing daring things, the cards are like tiny versions of the luridly printed, adventure-based dime novels that were popular in the late nineteenth century. The “occupations” are legal and illegal, thankless and glamorous. In the collection, a “safe robber” finds his place alongside a policeman working a “tough beat” in an immigrant neighborhood. The romantic “Indian Scout” and the lowly picket standing watch both get their due. Most of the “occupations” are male, with a female circus rider the one woman to be found. The cards each have text on the back, telling a bit of a story. The text gestures toward dangerous incidents—the picket gets a bayonet through his stomach, and the Spanish bullfighter is shown in midair, having been tossed by the bull. 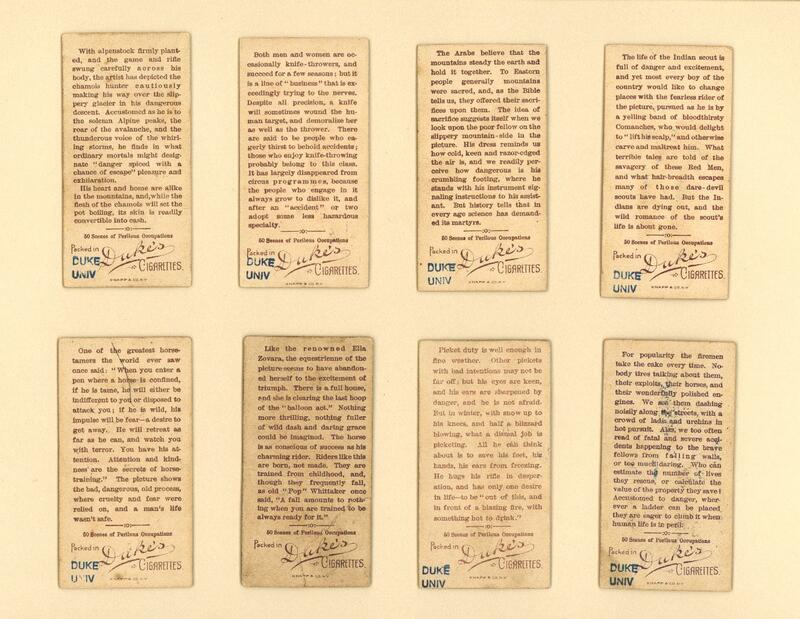 But at the same time, the cards have an educational bent, informing the reader about faraway customs. Some cards quote Shakespeare and Byron. 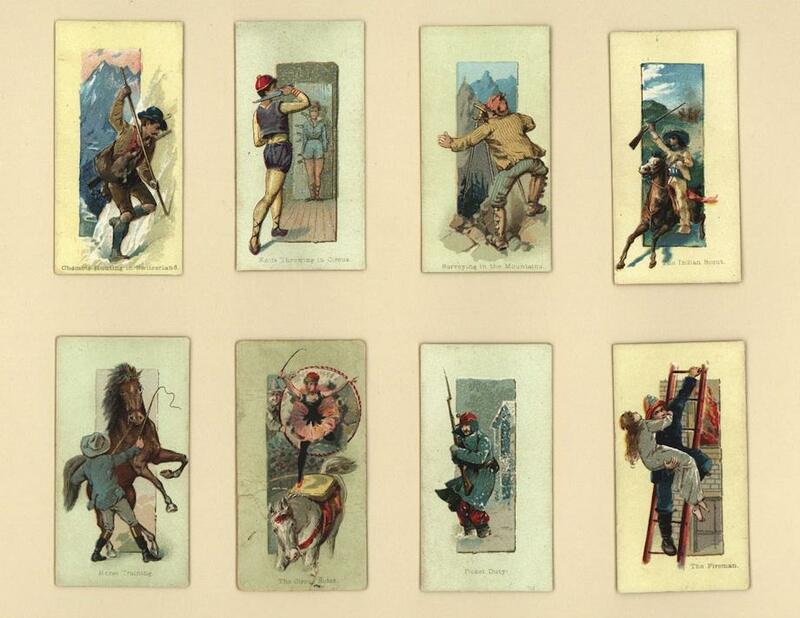 This series of cards, with images of the text on their backs, can be found in Duke University’s Emergence of Advertising in America digital collection, which also holds many other groups of cigarette cards. W. Duke., Sons, & Co, Advertising Materials, 1876-1904 - D0244. Emergence of Advertising Online Project. John W. Hartman Center for Sales, Advertising & Marketing History. Duke University David M. Rubenstein Rare Book & Manuscript Library.